Did we just witness a technological leap? Ford’s announcement of using a new type of Corning Gorilla Glass in a production vehicle is not just interesting because it’s an industry first for a new type of Gorilla Glass formulation, but it also that it signals a leap of technology from the consumer electronics industry to the automotive industry. Being a student of innovation, the adoption rate of technology is always a good measure of its value. Something that makes the commercial leap from early adopters to mainstream application is always an important signal. The speed of this adoption – or diffusion as it is sometimes called – is measure in a variety of ways as discussed by futurist Ray Kurzweil and others. Kurtzweil and others such as Nick Felton in this article on the website Questionable Economics have noticed a decreasing trend in the average time of technology adoption in American Households as time goes on. In their announcement, Ford clearly clearly states the inspiration for this new Gorilla Glass hybrid windshield was inspired by its success in consumer electronics. However, the application of this tough, scratch-resistant glass did require some advancement for use in its new environment. 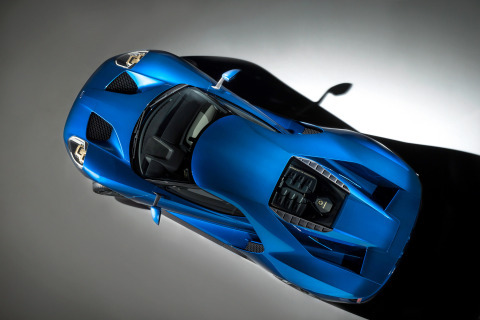 As a windshield in arguably one of the coolest cars on the planet that I will never drive – the Ford GT Supercar – the new glass could certainly leverage the durability and scratch-resistance of its technological inspiration, but would need to be made in a significantly larger form factor, thereby increasing its weight. The larger size also represents a manufacturing challenge as the volume of glass required per unit increases the likelihood material defects. Furthermore, unlike a smartphone screen, the car’s aerodynamic shape necessitates higher curvature to the glass. Corning and Ford appear to have solved these issues using a hybrid lamination of toughened hybrid glass inner layer, an advanced noise-absorbing thermoplastic layer in the center, and an annealed glass as the outer layer. This new combination claims to be 25%-50% thinner than traditional glass, saving 12 lbs on the car. Considering the impact of this weight savings on the physics of the car’s handling, it can also contribute to faster acceleration, better handling, increased fuel economy – although not likely a concern for purchasers of a supercar – and increased braking performance. With all this goodness, how could the new Ford GT not be officially on my holiday gift wish list? If you are wondering about the technology of Gorilla Glass and how exactly Corning is able to achieve a level of performance that defies every dropped glass or misdirected baseball of your youth, you owe it to yourself to take a brief trip over to Corning’s YouTube site. They’ve produced an entertaining and informative series about their innovations with the help of the Myth Busters, Adam Savage and Jamie Hyneman. Advancements in technology and revolutionary innovations are always inspirational to me. Witnessing was can be accomplished by a dedicated and collaborative team always make me appreciate how cool it is to be an engineer and understand the impact we can have in creating what’s next. Whether it’s in the what of the raw technology like Gorilla Glass or in the how that technology is applied like the Ford GT Supercar, empowering uncommon knowledge is the spark that begins it all. Have any examples of technology leaps that come to mind? Any examples of innovations that inspire you as an engineer? Share your thoughts in the comments section below and don’t forget to follow us on your favorite social media channel.